Season the pork with the peppercorn and garlic seasoning and sear it on high heat on all sides, including the ends, for about 10 seconds. Turn the heat down to medium, and pour about a half of the jar of BBQ sauce into the pan. Cover and cook for about 25 minutes. Cut the tenderloin in half and pull the pork using two sturdy forks. Then add the pulled meat back into the pot with the BBQ sauce and mix it together. Using one bag of cole slaw mix, add � cup of cracked pepper vinaigrette, a handful of cashews and toss together. 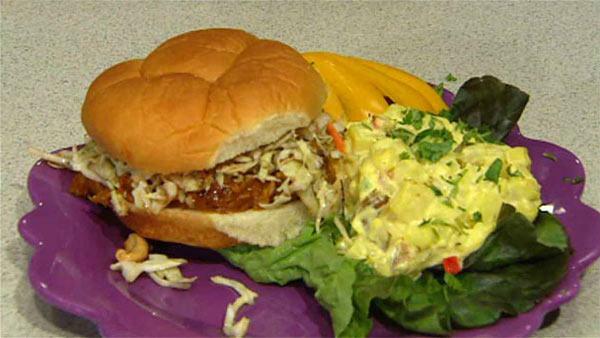 Put pulled pork on a bun and top with coleslaw mix. Enjoy!